Knightsteel pendant with pure Platinum inlaid Dragonflies and Diamonds dance around the slightly domed surface. Pure Platinum inlaid Dragonflies and Diamonds dance around the slightly domed surface of this pendant made in Knightsteel. There is a line of pure Platinum shaped inlay going all the way around the outside edge. It has twelve .01 ct. round brilliant Diamonds (.12 ct. total) that are D to F in color, Internally Flawless to VVS in clarity with excellent polish, proportions and symmetry. 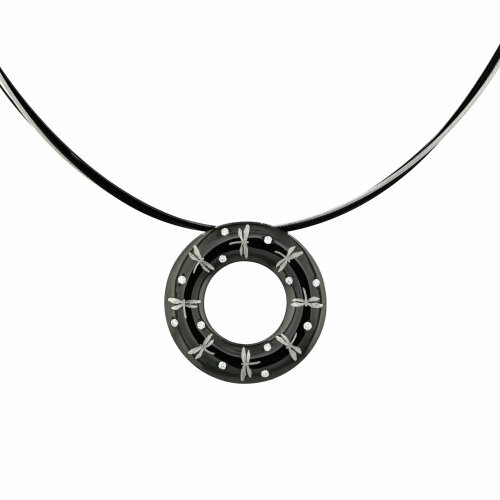 The 15.5″ chain is a multi-strand long lasting blackened stainless steel intertwined with a 18K white gold neckwire. It has a stainless steel tube clasp.